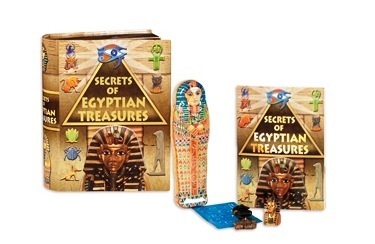 This enjoyable and educational activity kit takes boys and girls on an imaginary quest to uncover mysteries buried in an ancient Egyptian tomb. A 32-page color-illustrated book guides kids on their journey to the Valley of the Kings, a famous Egyptian archaeological site where many pharaohs' tombs are located. They find a hidden tomb entrance, go down into the burial chamber, and find a room filled with ancient treasures and a sarcophagus that holds a mummified pharaoh. Items accompanying the book include a miniature tin mummy case, a stencil with hieroglyphic symbols and letters, a plastic pharaoh's head, an Egyptian mask, and an Egyptian-style necklace. Here are the ingredients for an imaginary adventure that also introduces children to the fascinating charms and mysteries of ancient Egypt's civilization as it existed more than 3,000 years ago.